In order to please our clients, and make migrations even more accurate, our development team has come up with another broad functionality expansion. This time, merchants obtained an extra opportunity - to migrate reward points from one shopping cart to another. Reward points are crucially important marketing tools and customer’s loyalty builders, that help merchants to increase profits. Besides being beneficial for shop owners, they often present a great value for a client, who might have been collecting them for a long time prior to migration. This is why, from now on, you’ll have the opportunity to transfer them effortlessly, and benefit from all their advantages on a new store. 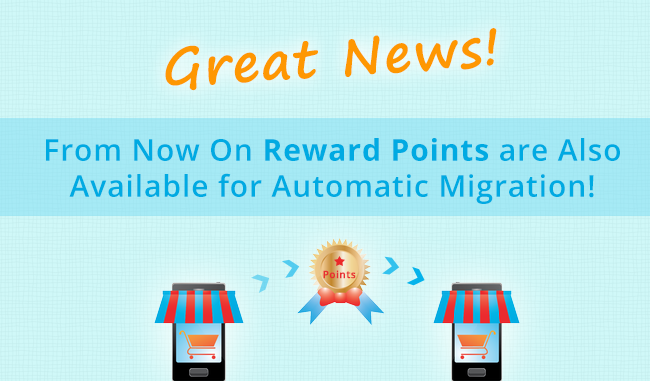 For OpenCart and 3dcart, we provide migrations of all reward points by default. However, in order to transfer these entities to PrestaShop, WooCommerce and X-Cart 5 merchants will have to install the necessary modules beforehand. Check the appropriate Cart2Cart’s FAQs to get more details on the matter. We sincerely hope that by enhancing migration opportunities, we’ll help to get your online retailer one step closer to prosperity. Cart2Cart team wishes you luck, more profits and clients!